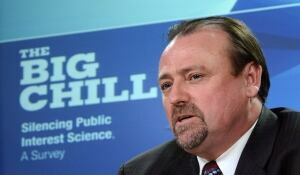 The Professional Institute of the Public Service of Canada (PIPSC), which commissioned the survey from Environics Research "to gauge the scale and impact of 'muzzling' and political interference among federal scientists," released the results Monday at a news conference. PIPSC represents 60,000 public servants across the country, including 20,000 scientists, in federal departments and agencies, including scientists involved in food and consumer product safety and environmental monitoring. 50 per cent of respondents said they were aware of “cases where the health and safety of Canadians" (or environmental sustainability) have been compromised because of political interference with their scientific work. 71 agreed that "our ability to develop policy law and programs that are based on scientific evidence and facts has been compromised by political interference," although a greater number (81 per cent) thought underfunding compromised those abilities. In recent years, there have been numerous complaints from scientists and the media about federal scientists being restricted from publicly talking about their research. Some complaints are being investigated by Canada's Information Commissioner Suzanne Legault. Dufour, principal of the science policy consulting firm PaulicyWorks, who once served as interim executive director at the former Office of the National Science Adviser to the Canadian government, added that the report's clear message means it could potentially generate constructive dialogue to improve the relationship between the federal government and its scientists. Patrick Fafard, an associate professor at the Graduate School of Public and International Affairs at the University of Ottawa and a former public servant, noted that the results of the survey are self-reported, and therefore "need to be taken with a grain of salt." Asked for a government response to the survey, Minister of State for Science and Technology Greg Rickford simply said, "Our government has made record investments in science."